We want our party to stand out, be visible, and be recognized. We do not want to blur in with what everyone else is doing. When our candidates use generic candidate signs there is no evident message. Designs for candidates who don't have a message are everywhere, and the cacophony of presentations of standalone names is a crowd. Unlike the Democratic and Republican parties, we stand for something. As true individuals we have agreed to work together with the message and goals of freeing our country. In the late 1970̷s our party gained one of the most recognizable logos ever created. Its message is unmistakable, and showing just part of the logo -- the head and torch arm -- is enough for it to be clearly identifiable. It stands out from the blur of circular logos and swooshes. Being forgettable is a terrible sin for a mascot or logo. Being invisible is even worse. The classical statue LP logo is very much both visible and memorable. It also has decades of exposure to build upon. Next we need consistent colors and typefaces. While there are color specifications used by the LNC, they are very hard to get a hold of, are not consistently applied, and do not look as good in print as they do on a screen. Denise Luckey of Texas has worked out a replacement gold and blue color scheme that has been tested, is ready for use, and has already been adopted by the state party, SIGLIB PAC, and dozens of candidates and county parties. Now you can too. Typography is not as settled as we would like, but we have narrowed down a set of choices. SIGLIB PAC has used Serpentine since 20̷0̷6; Garamond is a past and future candidate for standardization in Texas. The state party is currently using Frutiger and Minion, two expensive proprietary fonts, but there is a free clone of Minion (Asterix SSi) and a close equivalent of Frutiger (DejaVu Sans and other Bitstream Vera Sans derived fonts). It is hoped that this disc is an easy and convenient repository for everything you will need to get started on a number of visual efforts: web pages, signs, banners, newsletters, advertising, and the rest. Have you found difficulties or annoyances with this disc? Do you have ideas for what might make it easier to use? Do you have a submission of something we're not providing? Please send an email to jamesg@dimensionality.com with the words SIGLIB DISC in the subject line. 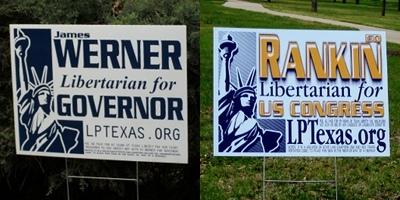 Signs of Texas Liberty started in 20̷0̷5 and printed its first candidate sign in 20̷0̷6. The idea for a standard sign template came from the Virginia state party from the turn of the millennium. While we are not using that specific template, we have used the underlying concept: a consistent template that draws attention to the party as much as the candidate. A template designed to maximize cumulative recognition, even if each sighting is a different candidate or message.
. Unlike that effort, we have persisted and continued to produce signs. While we have made some refinements to our template over the years, we hope that the current signs are recognizably similar to our James Werner for Governor sign in 20̷0̷6. While modestly funded, we have provided more than 250̷0̷ signs for roughly two dozen candidates and issues since 20̷0̷6. Obviously, with improved fundraising we could do a lot more. With this disc, however, we don't need to do it all directly. What improvements would you like to see or would like to help with? Please send an email to jamesg@dimensionality.com with SIGLIB DISC in the subject line. The artist for the classical statue logo is unknown to us. If you know who drew it or even what year, please pass the information on! Serpentine, Frutiger, Cambria, Pantone, and other trademarks are hereby acknowledged. Use of these and other trademarked terms is for identification purposes and not with an intent of dilution. Similar applies to Babylon 5, which is also used as the name for a set of free fonts that we use but did not name. Badge-A-Minit is a trademark of Badge-A-Minit and is mainly used to identify one of their non-standard sizes (2 3/8 inch, which they refer to as 2 1/4 inch. Templates and ready-made buttons for what they call 3 inch (2 7/8) are not provided for in this edition. A shout out of thanks goes to Denise Luckey for her work on standardization. Web colors are according to MyPantone software by Pantone.